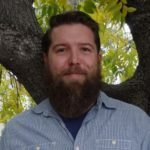 Rocky has been working with Trees for Tucson since shortly after moving to the area in 2010 and became an ISA Certified Arborist in January of 2016. Throughout his time there he has helped coordinate tree deliveries and tree planting and pruning events all over the area. Outside of Trees for Tucson, he enjoys gardening and preserving his garden’s harvest through canning, as well as photography, welding, camping and hiking all over the beautiful southwest.